India’s economic development is likely to have a considerable impact on future international energy markets—including U.S. energy exports—because of the country’s large population and potential for growth. India is predicted to be one of the fastest-growing economies in the world over the next 30 years, yet how that growth will occur remains uncertain. In the International Energy Outlook 2018 (IEO2018), EIA analyzed three economic growth patterns in India that have the same rate of overall economic growth, and the results show only slightly different energy demand among those three. Indian energy consumption is projected to be largest if exports account for more of gross domestic product (GDP) in 2040, rather than investment or consumption. IEO2018 compares three different cases of Indian growth relative to the IEO2018 Reference case. The three IEO2018 India High Growth cases assume a greater rate of GDP growth—1.1 percentage points per year higher—than in the IEO2018 Reference case. The IEO2018 makes different assumptions about the relative size of the components of GDP in each of the India High Growth cases compared with the IEO2018 Reference case. In the Export-led case, exports account for a larger share of GDP in 2040 than in the IEO2018 Reference case. In the Investment-led case, investment and exports are both larger than in the IEO2018 Reference case. In the Consumption-led case, personal consumption accounts for more of India's GDP in 2040 than in the IEO2018 Reference case. In the Export-led case, exports account for more than double the share of GDP in 2040 compared to the IEO2018 Reference case and is patterned loosely after South Korean economic growth in the 1960s–1990s. The largest increase in energy consumption—33% greater than in the IEO2018 Reference case in 2040—occurs in this trade-intensive scenario, bringing India’s total energy consumption to more than 42 quadrillion British thermal units. In the Investment-led case, investment and trade account for a larger share of Indian GDP in 2040 than they do in the IEO2018 Reference case, a pattern similar to China’s growth over the past 40 years. Exports and investment in this case each account for about 35% to 40% of Indian GDP. 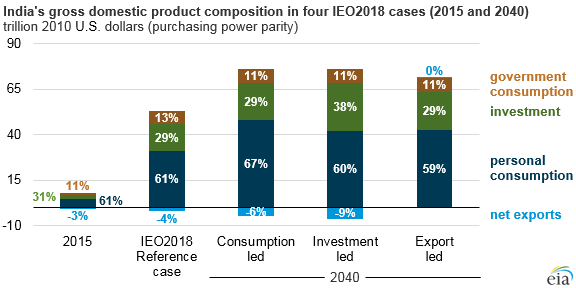 The result is a 29% increase in energy consumption in 2040 relative to the IEO2018 Reference case, making it the second-highest energy increase of the three India side cases considered in IEO2018. In the Consumption-led case, India’s personal consumption accounts for a larger share of GDP in 2040 than in the IEO2018 Reference case. Although this case is not patterned off any particular country’s development, it mimics U.S. levels of consumption relative to GDP. The lowest increase in projected energy consumption occurs in this case—13 quadrillion British thermal units—a 26% increase over the IEO2018 Reference case in 2040. Across all cases, however, energy consumption per person in India in 2040 remains lower than in other large economies in 2015. For example, in 2015, Russia, China, South Korea, and the United States all had levels of energy consumption per person that were at least four times larger than projected for India in 2040. This is in spite of the fact that India is projected to be the world’s fastest-growing economy over the 2015 to 2040 period in the IEO2018 Reference case and the three IEO2018 side cases highlighted here.